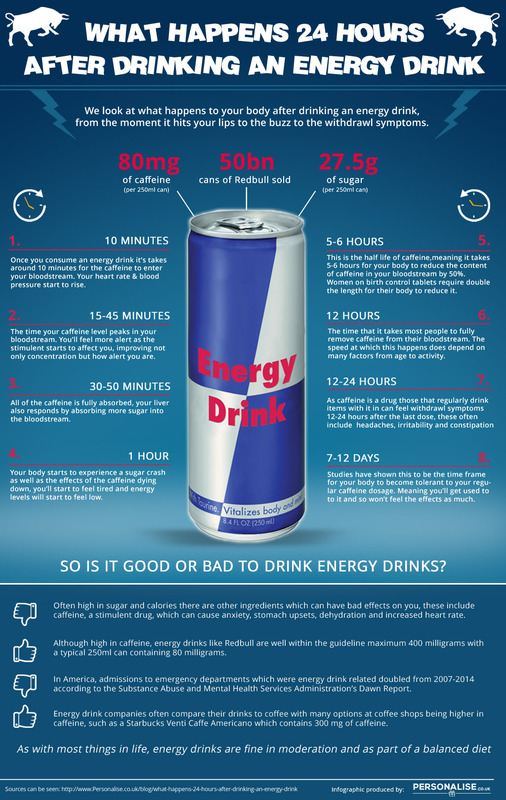 A new infographic developed from information obtained by National Health Service (NHS), the US Food and Drug Administration (FDA) has revealed what an energy drink can do over a 24 hour period to the human body. Enery drinks have been increasingly marketed to teeagers and children with detrimental health impact. Caffeine and sugar are the most common ingredients in these drinks, and some brands contain plant-based stimulants, such as guarana and ginseng. The amount of caffeine in one energy drink can range from 80 mg to over 500 mg. One 5-ounce cup of coffee contains around 100 mg of caffeine. A 250 ml can of Red Bull contains around 27.5 g of sugar. Numerous studies have correlated numerous adverse health benefits with energy drink consumption; including altering the heart function of healthy adults, while another study links energy drink consumption to other unhealthy behaviors, such as smoking. The infographic describes the effects of energy drink consumption and the associated time frame. Within 10 minutes of consuming an energy drink the heart rate rises as does blood pressure.